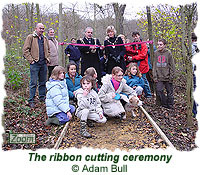 Many paths run through Gledhow Valley Woods, some of which are were deliberately planned and others which have become established over many years along frequently trodden routes. Some of the paths can be slippery and unpleasant to walk on when they become muddy or overgrown, and those which climb the valley sides can be especially treacherous when covered in Autumn leaves. 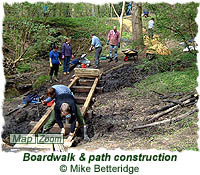 The Friends work to maintain and improve these paths by removing debris and cutting back encroaching vegetation, surfacing with gravel, building and reinforcing steps, and in some cases constructing wooden boardwalks. 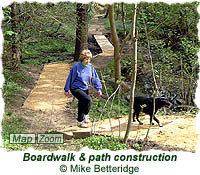 The resulting pathways are clearly marked, safe and pleasant to walk along for both the young and old. 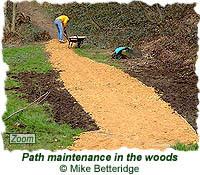 When paths are well maintained people are more likely to use them, and this benefits local plant and animal life by cutting down random trampling as well as limiting the spread of litter. 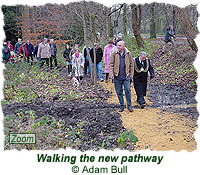 In November 2004 one of the sections of path built by the Friends between Gledhow Lane and Allerton Grange Way was officially opened by the Lord Mayor of Leeds Mr Christopher Townsley and the Lady Mayoress Mrs Margaret Townsley. 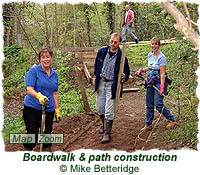 Most of the path building and maintenance tasks are carried out on regular Action Days organised by the Friends group. There is usually one Action Day each month, and the sessions last about two hours (although people aren't expected to stay the whole time unless they want to). Anyone is welcome to attend these Action Days, and all help is gratefully appreciated. All equipment that might be needed is supplied by the Friends, including gloves, spades, rubbish bags, litter picking claws, etc.